If you’re in the mood for something creamy…and leafy, then try this delicious dish. The coconut milk adds a nice nutty flavor to the greens. Quick and easy and of course full of vital nutrients! The kale is a great source of vitamin A, C, K, Iron, Magnesium, and Calcium. Yes, contrary to popular belief, milk is not the only good source of calcium. Green leafy vegetables are great sources of Calcium. 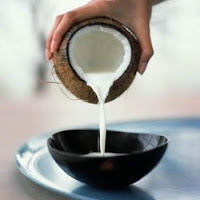 Coconut milk is a great brain food! It is full of medium chain saturated fatty acids to support optimal cognitive and metabolic function. It’ll add satiety to your meal, keeping your belly feeling full and happy longer. 1. Saute garlic, onion, oil and leek in a large saucepan/stew pot. About 5-7 mins. 2. Add coconut milk, mustard, and rice vinegar. 3. Simmer on med heat, covered, about 12 mins. (Kale should be very tender and wilty). Add garbanzo beans and serve over a bed of brown rice for a complete meal.